We've been waiting for the new generation of flameskimmers, aka firecracker skimmers (Libellula saturata), to visit our yard after the long winter. On Sunday, a male flameskimmer did. It perched on a bamboo stake, soaked up some rays, took flight, and then returned to its perch. 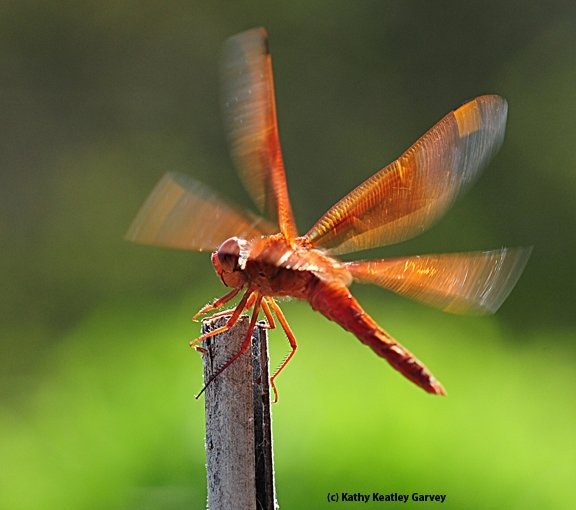 It glittered in the morning sun, a ruby helicopter of an insect. Finally, it clumsily took off, zigging and zagging over the cherry laurel hedge. Meanwhile, a Western scrub jay nesting in the cherry laurels tracked its movements. 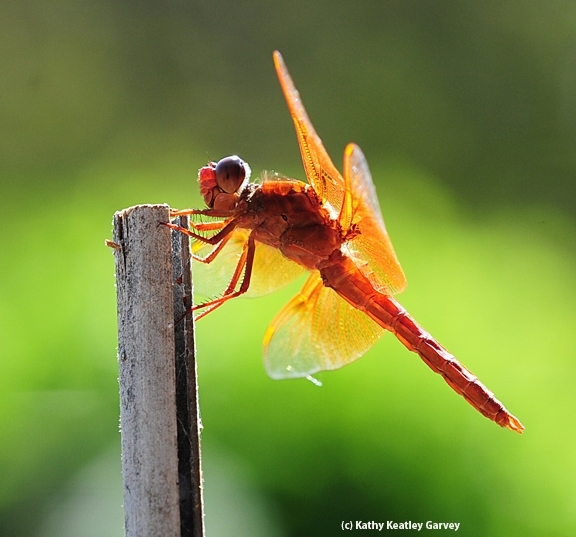 Says Wikipedia: "Due to its choice habitat of warm ponds, streams, or hot springs, flame skimmers are found mainly in the southwestern part of the United States. They also make their homes in public gardens or backyards." "An immature flame skimmer (nymph) feeds mainly on aquatic insects. Its diet consists of mosquito larvae, aquatic fly larvae, mayfly larvae, freshwater shrimp, small fish, and tadpoles. The nymphs, which live in the mud at the bottom of warm streams or ponds, catch their prey by waiting patiently for it to pass by. Adult skimmers usually feed on moths, flies, ants, or any other soft-bodied insect while waiting perched on a small rock or twig or while flying through the air." It's our fish pond that draws dragonflies to our yard. To accommodate them, we've posted a dozen bamboo stakes at different heights, from four feet to six feet. Finches and hummingbirds perch on them, too.